The Glasgow Necropolis is a fascinating Victorian garden graveyard which stands next to Glasgow's mediaeval Cathedral of Saint Mungo's in the East End of Glasgow. The cemetery covers an area of 37 acres on the second highest hill in the city and it is easily accessible by several forms of public transport. The history of the Necropolis is a highly interesting one as it was one of the few cemeteries from the 19th century to keep detailed records about those buried within its confines. It was inspired by the renowned P�re Lachaise cemetery in central Paris, as a place of visit and not simply of burial. The site has been administered by Glasgow City Council since 1966. The Friends of Glasgow Necropolis is a registered charity which organises walking tours of the Necropolis about once a month in winter and more often in the summertime. These informative and informal tours are conducted by volunteer tour guides, experts on the subject. These tours are hugely popular and advance reservation is advised as places are limited. The tours are free of charge although donations towards the restoration projects within the Glasgow Necropolis are greatly appreciated. More information about the Glasgow Necropolis, some historical facts about the site and dates and times of guided visits is available on the website of The Friends of Glasgow Necropolis - www.glasgownecropolis.org. 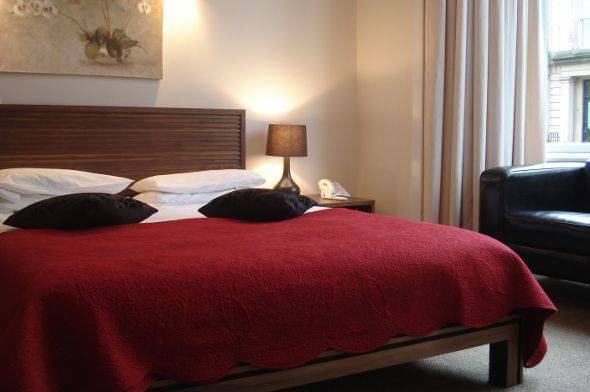 The Sandyford Hotel is a family-run 3* hotel conveniently located between the City Centre and the West End of Glasgow. If you are visiting Scotland's largest city and looking for accommodation near Glasgow Necropolis, we will be happy to welcome you. There are 55 comfortable rooms available, all with tea and coffee-making facilities and en suite bathrooms. Our bed and breakfast prices are very affordable and full Scottish breakfast is included in our cheap rates. A member of staff is on hand 24 hours a day to assist you and offer advice about using the public transport system to get around. For comfortable B&B accommodation near Glasgow Necropolis, call us today on (+44) 0141 334 0000. We will be happy to answer any questions you may have and confirm your reservation. You can also make a booking enquiry with the help of the online booking form.